I suppose you wouldn't necessarily call these 'Old Favourites', but they are all Holy Grail products for me, so I have to repurchase as soon as they show any sign of running out. The first of which is the Rimmel Wake Me Up concealer. I actually use two shades of this: True Ivory and Soft Beige, and repurchased True Ivory a few months ago. I probably use Soft Beige more as it's more appropriate for when I'm a bit more tanned, and so this just had to be repurchased. 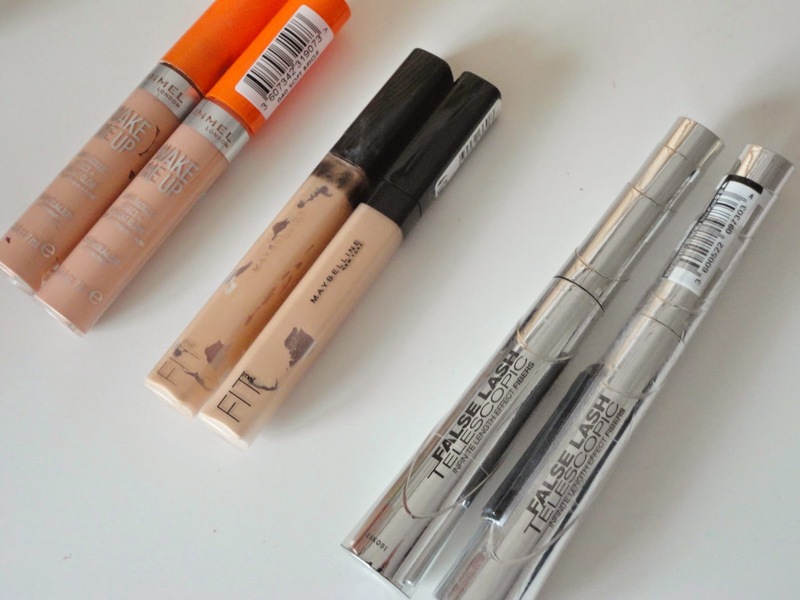 You can read more about why I l-l-love this concealer in the post linked above.The second repurchase was another concealer, the Maybelline Fit Me concealer. I have never done a review of this (but maybe I should now I have my brand spanking new tube!) but I love this concealer; it's thicker than the Rimmel one, making it perfect for blemish concealing, but I also use it under the eyes every so often. The final repurchase was my favourite mascara: the L'Oreal False Lash Telescopic. I originally bought this thinking it was the one that Carli Bybel uses (it's not), but I really love it. I then repurchased it but accidentally bought the brown one, which I have now used up so I'm back to the black version. I've found that although it isn't waterproof, it stays put much better than my L'Oreal Telescopic and really elongates lashes whilst making them look nice and thick. It's also now a total pain to remove (bonus!). Have you repurchased any of your Holy Grail products recently?